The Global Educator: 5 levels to take your classroom global! 5 levels to take your classroom global! Successful online global collaborations require some structure and planning. Educators need to be aware that planning that includes design and implementation is paramount to engaging students and building in success for global learning. 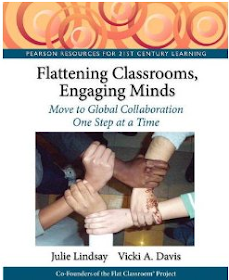 Newcomers to global collaboration may find it easier to join an existing project or implementation that already has experienced educators who are leading the collaboration. 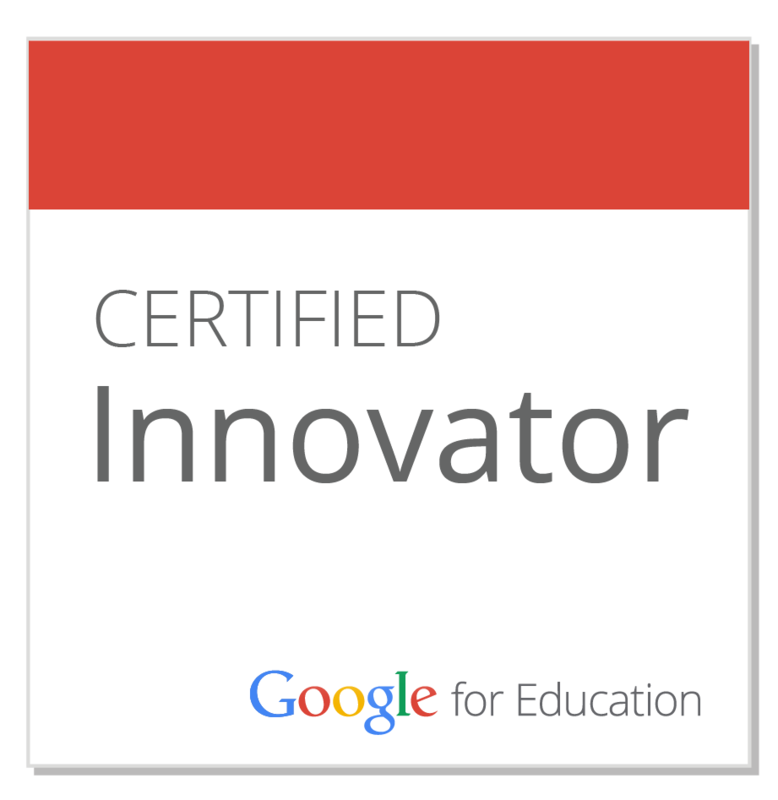 This often provides a shortcut to best practices and a ready-made PLN for support. For those wanting to design, run and manage their own global collaborations the Online Global Collaboration Taxonomy may provide the key. The Online Global Collaboration Taxonomy, explained briefly here, provides FIVE ways to move into online global collaboration. It shares the type of collaboration, purpose and communication mode as well as current examples to get started. This level applies to asynchronous communication and involves sharing online learning via digital platforms for others to interact with. Examples for this include class and individual blog posts as well as digital artifacts posted online for others to view and comment on. The goal of this level is to connect in real time using whatever tool is available to those connecting. This may be Skype or Google Hangout or other video or chat-based apps. Synchronous interaction means learning is instant and participants can ask questions, share media and build understanding of each others in a very short time. The ‘mystery Skype’ is a typical examples of this ‘real encounter’ level, As is bringing experts in to support curriculum objectives. The aim of this level is to encourage learning through digital interaction and sharing of artifacts. It applies to the development of online communities to support curriculum objectives and may be localized (between classes and schools in the same geographic region), or more global. The learning focus is asynchronous interaction, although some serendipitous synchronous (real time) communication may take place, such as a chat facility for participants. Examples include student or teacher led online communities to support curriculum objectives such as MOOCs, discussion forums, and platforms that share multimedia. 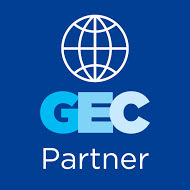 Projects like Global SchoolNet Cyberfair, PenPal Schools and eTwinning provide opportunity and resources to learn collaboratively online as part of this level. As distinct from Level 3, this level is designed for the purpose of specific learning objectives as a global community of learners. Communication can be both synchronous and asynchronous. The community of practice would normally have a shared objective such as a global collaborative project and probably a set timeline that dictates workflow and communication patterns. The essential goal is to foster authentic and diverse online global collaborative practices. Examples include the very popular ‘Global Read Aloud’ where a small group of classrooms are joined together for the purpose of reading a book over a few weeks. The Flat Connections, ‘A Week in the Life’ project for upper elementary school is also a good example here where teachers and students create a community around the exploration of global issues and share ideas and create multimedia artifacts together. 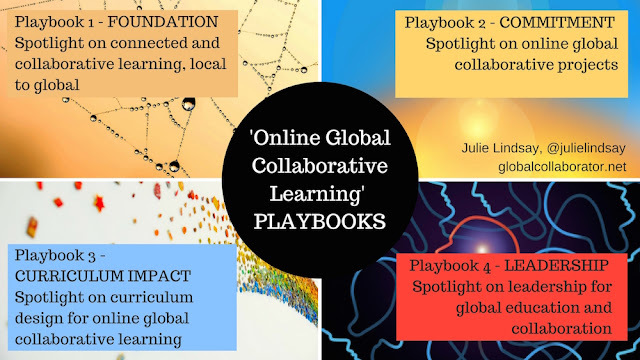 The purpose of this community is a little harder to grasp and basically it is about fostering learner autonomy for online global collaboration. Each member of the collaborative (educator, student, community partner) has the confidence and ability to initiate collaborations and co-creations within the collaborative. The learning paradigm is redesigned to encourage students to take leadership roles and in doing so co-create solutions to global problems and challenges. The Connect with China Collaborative is an example of this level, where ways to connect between China and other places are explored to increase global collaborative opportunities for learning that include educational institutions and diverse community members. Remember - Designing a global collaborative experience involves transcending the obvious real time linkup, fostering higher order thinking and providing opportunities for cultural understanding while usually making a product that impacts others in a positive way. 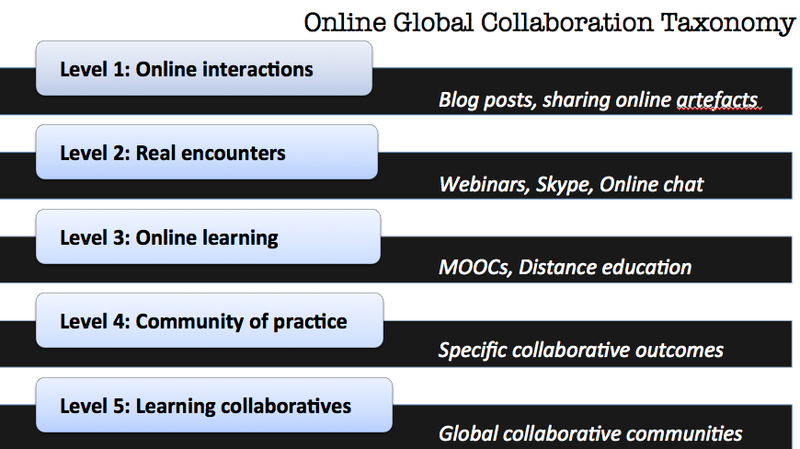 Use the Online Global Collaboration Taxonomy to start building this today! 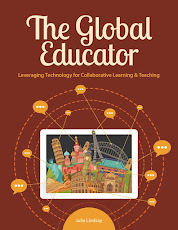 Explore more ways to connect your learning and embrace online global collaborative practices in Julie Lindsay’s book The Global Educator: Leveraging technology for collaborative learning and teaching. Don’t forget to tweet using hashtag #theglobaleducator when sharing collaborations and best practices for global learning!